Recently I decided to take the plunge and purchase my own Dedicated Server to run my Websites and Mobile App Web Services. I had until this point been running these sites and services via a Reseller Hosting Account from Fasthosts. Whilst we'd always had a good relationship, there have been times that applications have fallen over, and that I have needed to go beyond the limitations of Shared Web Hosting environments. I decided I would stay with Fasthosts, but purchase my own Dedicated Server, as part of the WebsiteSpark scheme, from Microsoft. Transferring all my sites and databases over to the new server, making configuration changes as necessary. Configuring Mail, FTP and other services too. With just a few stumbling blocks, all website services are now up and running, on Windows 2008 / IIS 7, and at blistering speed. My Mobile Apps that rely on web services now return lightning fast results too. I am glad I went down this route, as I can now do a lot more with my code, due to having direct control of the Software available on the Server. My new kit is very lean, with plenty of disk space, and only a few dozen sites running - as opposed to the 1,000+ sites that could be sharing your "shared" web hosting! I also have my own Dedicated IP Addresses. These, combined with significant response time and delivery speed improvements, can only help with Search Engine Optimisation of the websites that run upon the server. What I am now using.. 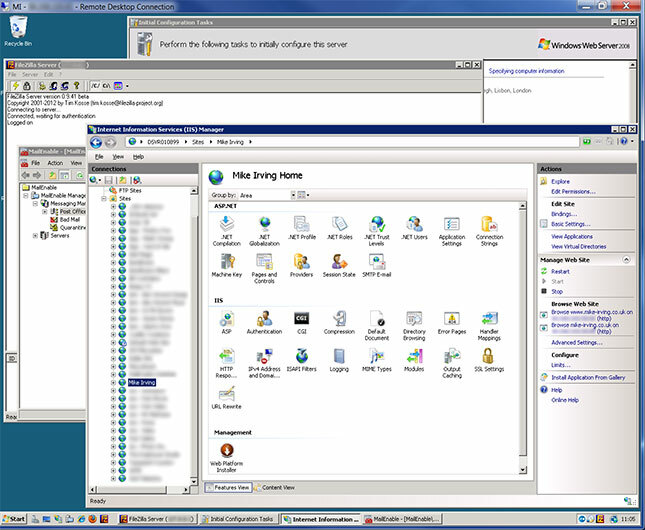 Being able to RDP in and make changes, Restart Websites and App Pools in IIS is a real bonus.